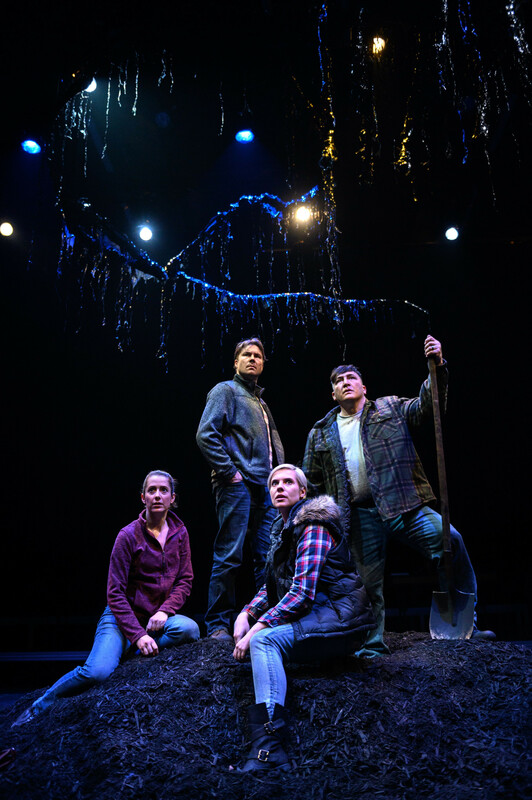 After the Fire, the latest offering from indigenous playwright Matthew MacKenzie, is a powerfully dramatic yet darkly comedic take on the aftermath of Canada’s costliest natural disaster, the wildfires that tore through Fort MacMurray, Alberta in May 2016. Presented by MacKenzie’s own Punctuate! Theatre and the Alberta Aboriginal Performing Arts in association with Native Earth Performing Arts and The Theatre Centre, After the Fire tackles a myriad of real life issues facing the community of Fort MacMurray, including job loss, debt, divorce, addiction, and crime, yet it is still peppered with moments of laughter and several mentions of “truck nuts”, as well as the odd hockey anecdote. Characters Barry and Ty are both indigenous Canadians, Barry having Cree roots and Ty, Métis. Both men face personal conflict, one man struggles to reconcile his spiritual connection with the land, flora, and fauna, with his knowledge of the ecological destruction caused by resource extraction in Northern Alberta’s oilsands; destruction that he contributes to and profits from through his employment. The other, wrestles with the repercussions of losing his job due to the downturn in the price of crude oil. The relationship between Barry and Ty, portrayed with brutal honesty by Sheldon Elter and Jesse Gervais respectively, underlines how industry has the power to divide indigenous people and communities as truths are revealed and the plot unfolds. While one turns inward, brooding and silent, the other lashes outward, attacking those he feels have wronged him, those who are to blame for his hurt. Anyone but himself. The circle is an important symbol in indigenous communities, representing the cyclical nature of the natural world. Set designer Alison Yanota thusly incorporates theatre-in-the-round staging and minimalist sensibilities to create the environment of the stage. The audience surrounds a large mound of ashen cedar wood chips heaped below a scraggly fire-blackened tree. In true Canadian fashion, there is an appearance by Tim Horton; coffee cups and a Timbit box litter the stage area before any actor ever appears. The scent of earth fills the space, increasing in intensity as Barry and Ty begin digging in the mound. Carmell (Louise Lambert) and her sister Laura (Kaitlyn Riordan) use the entire theatre space as they embark on their journey, separate from the two men, their husbands. They traverse the space, through the staging area, behind the seating, through the mound, their story circumventing the central action portrayed by the men endlessly digging in the middle of the room. Lighting is used sparsely. It is dark in the room – nighttime. At times throughout the show, designer Kaileigih Krysztofiak speckles the area with green light. Is it the glorious glow of the Aurora Borealis overhead, or the sickly reflection of toxic tailing ponds? Horrific shadows sprawl across the walls as light hits the bent and broken branches of the tree. Beams of white light are used cleverly to replicate narrow ledges that Carmell and Laura inch along as they make their way to their destination. As the action meets it climax, in a scene that seems somewhat out out of place in the context of the rest of the play, strobing red lights rip the audience, maybe a little too jarringly, out of the quiet night time scene. Gone is the airy soundscape created by Dean Musani, the gentle chirping of crickets, the occasional call of geese flying overhead, the rustle of wind through trees. In its place, throbbing synthy beats, the characters flail at the earthen mound with their arms, calling out in their individual and collective distress. While the choreography of the scene does not match the nuanced grace of Monica Dotter’s work in Bears, MacKenzie’s previous play, it aptly communicates the anguish within the characters’ misadventure, how they got to the place they’re in, and how they can escape it. On the surface, After the Fire is a story of the devastation, both human and environmental, caused by the fires that destroyed a community, but it is more than that. Whereas Bears focuses mainly on the environmental repercussions of resource extractions, After the Fire takes a more personal and holistic approach to issues, addressing the political, environmental, and personal implications of working in Alberta’s oilsands, especially as an indigenous person. As the nation watches the RCMP take action against the Wet’suwet’en nation water protectors over the Coastal GasLink natural gas pipeline injunction, it is undeniable that the stories told in After the Fire, are the stories of a nation at a crossroads, a nation in conflict. It leaves the audience to question: How can we as a nation on one hand prioritize reconciliation with indigenous communities and environmental protections such as carbon pricing, yet still benefit economically from the resource extraction industries that exploit indigenous communities and the environment? After the Fire plays at The Theatre Centre until January 19.